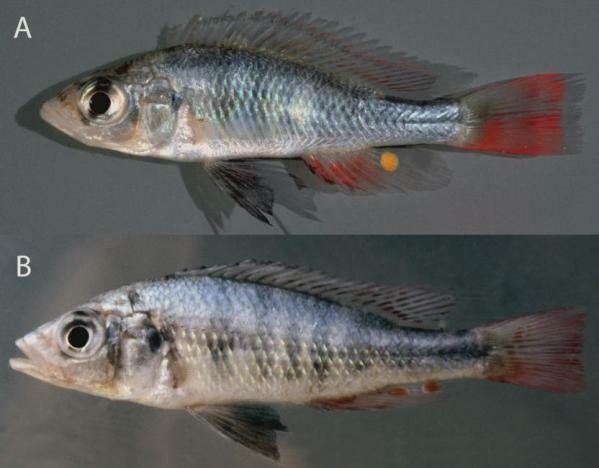 Haplochromis argens has been known to both aquarists and scientists for several decades and was previously referred to as H. sp. ‘argens’ among other names. It is diagnosed by its small size (< 8 cm SL), slender body (depthBD < 31% SL), micrognathism (lower jaw length < 45% head length) and slightly curved to straight dorsal head profile. Its teeth are relatively long and slender, and mainly bicuspid. The premaxillary dentigerous area extends almost to the caudal end of the dentigerous arm. Haplochromis argens. © de Zeeuw et al. Base body colour is somewhat silvery with conspicuously ivory-white lips, there are three to five, generally faint vertical stripes on the flanks and a faint, dark, mid-lateral band is visible in some individuals. Males have a yellow to greenish sheen on the flanks. 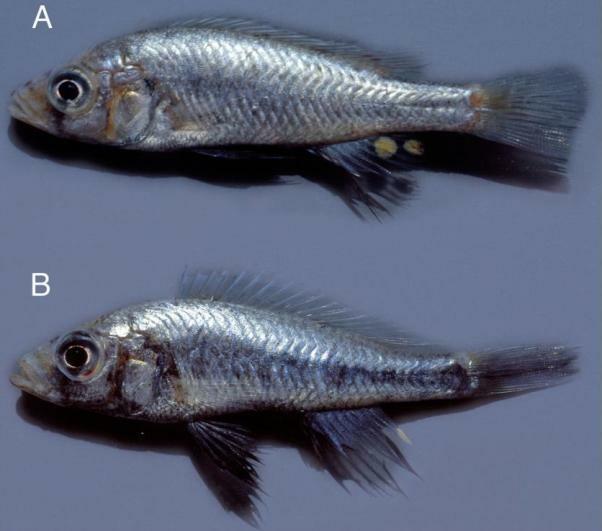 H. argens was formerly abundant in the lake but declined drastically during the 1980s and 1990s, and although still present in small numbers it has apparently failed to recover to the extent of some related species. 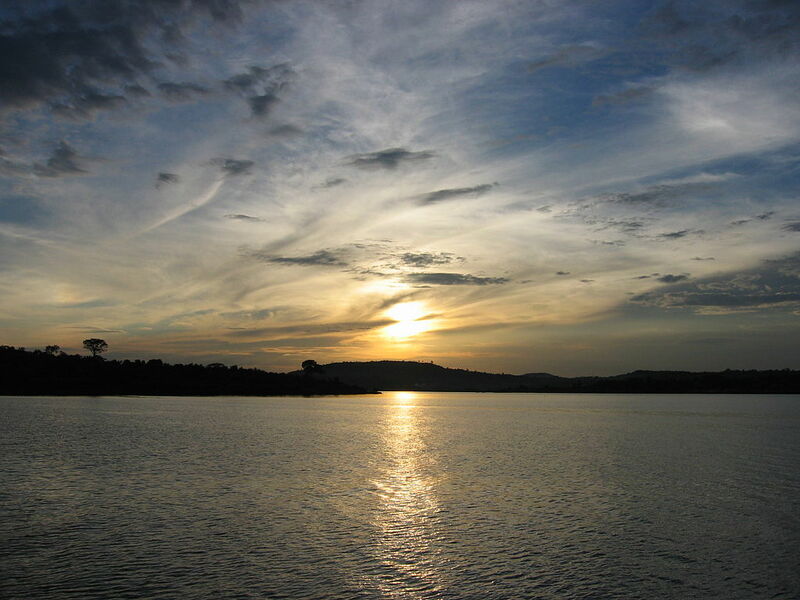 It is known from Mwanza Gulf, the south-western part of the Speke Gulf, in the area around Kome Island, and in the Emin Pasha Gulf, all in the Tanzanian part of the lake. The second species is named H. goldschmidti and was formerly referred to as H. sp ‘dusky argens’ due to the colouration of nuptial males which have a dusky flush on the flanks. Haplochromis goldschmidti. © de Zeeuw et al. It is also small (< 7 cm SL), slender (body depth < 28% SL), micrognathic (lower jaw length < 45% head length in all but a single specimen) and has a slightly curved to straight dorsal head profile. Its teeth are mainly bicuspid and the caudal 20-25 % of the premaxillary dentigerous area is generally edentulous (lacking teeth). Males are silvery with a dusky flush on the chest, flank, ventral side and ventral portion of the caudal peduncle, while females are not included in the description since it was not possible to distinguish them from those of H. argens. H. goldschmidti is known only from the southern part of the Emin Pasha Gulf and its conservation status is unclear.